If it sounds like a scene from a classic Egyptian film, it isn't. This happens weekly in Chicago, Illinois, for this is the home of Sonya, and this is what she does best. Anyone who has seen her dance will attest to her presence on the stage, in the nightclub, or in the restaurant. Such a dedicated and talented performer is certainly fated for great things. Sonya hopes every day for greater opportunities to learn and teach and perform her chosen craft. All of her life rotates around the celebration of womanhood and femininity that is Raks Sharki, or belly dance. It is this intense focus and stubborn will to succeed that drives her, and she hopes to be an inspiration to other young dancers everywhere. This dream, and her passion to follow it, has carried her to her current state of recognition as one of the rising stars of the Midwest." Sonya discovered belly dancing in Spring of 1996. She quickly became a dedicated lifetime student of all things belly dance, from the history of the dance to its most contemporary styling, from folkloric to fusion, from the music in all its forms to the traditional costuming & makeup, from teaching it to the glorious performance of belly dance itself! Her firm grounding in Egyptian style Arabic dance would be the foundation she built on forever. 6 years as a principal dancer in 2 dance troupes where she performed folkloric, traditional, cabaret, and themed or "interpretive" Mid-East dance in more than thirty-five choreographed theater shows in her first 8 years, fusing her study of Tahitian, Polynesian & Bollywood/East Indian with flavors of Oriental & Andulusian dance. 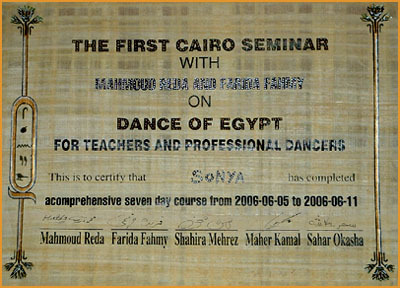 In Spring of 2006, with 10 years of technical dance training under her "belt", Sonya traveled to Cairo, Egypt to intimately study the dance with world renown instructor & choreographer Mahmoud Reda, and with Egypt's "Queen" of dance itself Farida Fahmy. Sonya is proud to be one in the first group of professional dancers to receive a teaching certificate in Egyptian belly dance from Egypt. She's ecstatic to have led a "zeffa" (wedding procession) in Cairo at The 5-star Intercontinental Hotel in Pyramids Park. Sonya continues to seek knowledge to enrich her instruction and dance skills by staying abreast of all the current trends & new innovations and generously imparts this knowledge to her students. One example of this is her Hadia teacher training certifications in muscluar & anatomy in our dance. Never one to let the dance stop with her, Sonya acts as an educator; realizing the value of her knowledge, she subscribes wholly to the belief that her talents mean nothing if she cannot share them with others. Utilizing the anatomy of movement, Sonya taught full-time for 5 years in Chicago and abroad before founding her own school of dance in Fall 2004, called Arabesque, and continues to teach 9 weekly classes there (beginning through advanced) in addition to monthly workshops, sewing clinics and costume sales while also giving a home to other fun and feminine dance forms for adults. She's proud to produce fine dancers with similar missions to uplift the art to the highest standard and is elated to see her students go on to win competitions, and also become respected educators themselves. Sonya often shares the stage with her own award-winning dance company Ro-He (Arabic for Soul) comprised of regularly attending advanced students of Sonya's who share the commitment and love of sharing this dance with others. Troupe Ro-He boasts regular group performances both locally & abroad, giving the valuable live performance experience to her students that she herself swears by, with a deep & serious conscientiousness of promoting the dance with all the dignity & grace that it merits. As an event sponsor, Sonya values the treatment and comfort of her fellow dancers, whom she employs for her own Concerts and Haflas (dance parties), as well as playing the role of Producer for her many annual large scale seminar and feature showcases, affectionately named to reflect their mission; Where the Mid-East meets the Mid-West gives platform to the more authentic traditions of Mid-East Belly Dance while Devil & the Deep Blue Sea is a bridge between Tribal-style Bellydance and the beloved Cabaret-style of our ancient dance of muscle isolation, articulation. Her Raks Gothique series featured much more than just alternative music and costuming, but rather a fusion of belly dance and the more macabre, showcasing those who's interest lie in taking belly dance in a complete different direction, especially in special prop use & storytelling. These forums are where Sonya can offer to the diverse local dance community (and throughout the midwest) a unique Chicago experience in outstanding instruction from abroad, as experienced by Sonya first-hand. Her theater shows are also celebrated for the skill level of gifted and eclectic performers from around the globe that are drawn to the well-planned weekend. As a multiple competition titleholder, award-winning choreographer, costumer & respected performer with knowledge well beyond the cabaret style, Sonya had been sought out to evaluate others in the way of technique, as a friendly tool for betterment in the role of judge for many annual competitions, however she does not believe this dance form to truly be a thing to "judge" one against another. "One dancer is sweet like an apple, another is a tart orange; this one a beautiful pineapple, another is a banana"; a favorite quote she recalls from one of her inspirational muses, denoting the beauty in all women dancing with the power of their heart. Sonya enjoys the traveling to perform & teach her fluid style of the dance, adding the angular locks with effortless shimmies and stunning undulations, and welcomes you to visit one of her Video Clips or Upcoming Events to witness live her expression of the music to make your own determination - DVDs coming soon.